In an urban setting, suspended pollutant particles enter our lungs along with air we inhale. A good portion of them gets deposited on our airways, often inducing toxic effects. A young child or an elderly patient facing an asthma attack reaches of the inhaler device. The breath that they so anxiously take from the inhaler carries into the lungs the particles of the drug that will help ease their asthma attack, provided those particles deposit where they are most needed. Understanding the multitude of factors that control pulmonary deposition is important in assessing the toxic or therapeutic effects of inhaled aerosol particles. Improving our understanding can contribute in the establishment of adequate environmental exposure standards as well as optimization of drug delivery methods for local and systemic therapies through the pulmonary route. A considerable amount of investigative efforts, both experimental and numerical, have afforded us a satisfactory level of understanding of general trends in deposition efficiencies. They also identified a number of important parameters that govern particle fate in the respiratory tree, such as anatomical variations between individuals (hereditary or due to disease-induced airway remodeling), breathing flow rate and frequency, particle size, shape and physical properties and turbulent nature of airflow among others. Yet, this overall understanding falls short of the precision one needs when optimizing pharmaceutical products consisting of inhaler-formulation pairs or when establishing links of particular pollutants to specific disease pathways in the airways. In vivo studies of aerosol deposition in the human lungs are limited by concerns over human safety and by resolution limitations of current imaging technologies. In silico models, based on Computational Fluid Dynamics (CFD) can fill this gap by providing an unprecedented level of detail that would allow scientists and engineers to experiment with alternate designs and conditions. In particular, recent advancements in medical imaging have afforded us detailed views of the complex structures of the lungs, such as the upper airways of a female subject shown in the side figure. 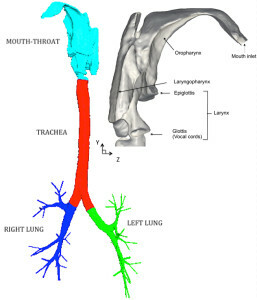 Starting from Multi-Detector Computed Tomography (MDCT) scans, a 3D model of the airways extending from the mouth to the generation 7 of the intrathoracic airways can be reconstructed using 3D image processing softwares. Advanced computational methods are used to solve numerically the equations that describe the air and particle motion in the human airways. The results can then be post-processed using data analysis and visualization software. Details of the airflow patterns, such as cross stream vortices and turbulent features, as well as deposition hot spots can be identified and correlated to the several parameters that describe the problem. In our recent study published in the Journal of Biomechanics, the parameters examined were the inhalation flow rate, the particle size and the electrostatic charge carried by the particles. Fig. 2. 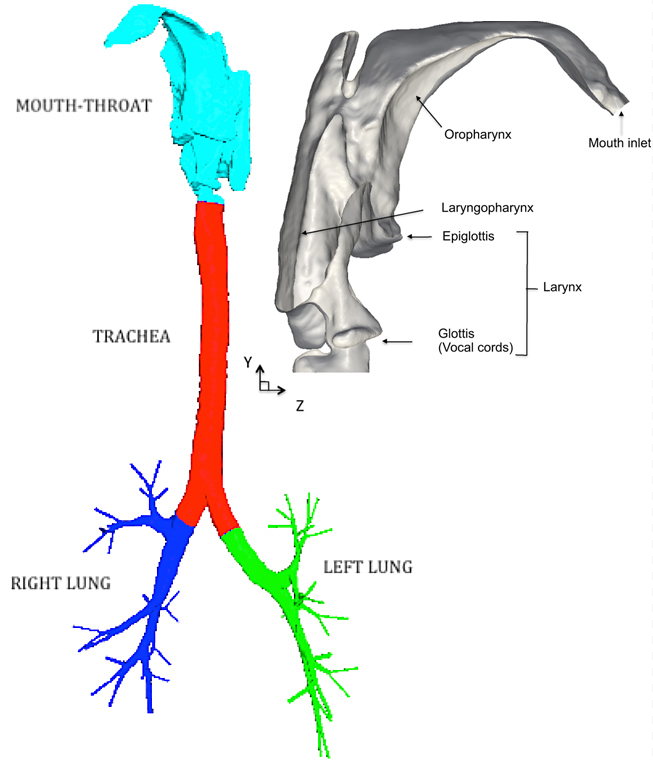 Deposition locations in the trachea and in the mouth-throat regions for flow rates of 15, 30 and 60 lt/min. For the trachea, particles with diameter of 2.5um are shown. For the mouth-throat region, particles with diameters of 5um (blue) and 10um (red) are shown. Greater filtering is observed as the flow rate is increased. We observe enhancement in deposition of spherical particles with diameters of 2.5-10μm as the inhalation flow rate is increased (15,30 and 60 lt/min) due to inertial impaction in regions with high curvature. Designers of inhalation devices can use this type of information to determine the size of the drug carrier particles and the device operating flow rate so as to minimize drug losses, enhance treatment and lower costs. Another outcome of our study is that smallest particles (0.1μm) have the highest deposition fractions in the mouth-throat when there is electrostatic charge above 250e. Such charge levels can be generated in inhaler applications, especially in Metered Dose Inhalers (MDI). Overall, our results indicate a significant interplay between particle size, electrostatic charge, and flow rate, that in silico models should be customized for specific applications, ensuring all relevant physical effects are accounted for in a self-consistent fashion. Particle deposition in a realistic geometry of the human conducting airways: Effects of inlet velocity profile, inhalation flowrate and electrostatic charge.